IRI Shopper Panel is run by a small, but very caring team who want to help companies understand how consumers use their products, and in turn, they take steps to ensure that participants of their program are rewarded fairly for their efforts. Participants are asked to scan their grocery purchases in exchange for a generous selection of gift cards. To join the Shopper Panel is pretty simple: simply click the “join now” button on this page, and fill out the information on the next screen. You will be given the option of being mailed a free barcode scanner, or you can simply download the Scan N Go app to your smartphone, which can also be used to scan your grocery purchases. 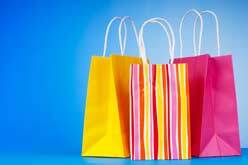 For every week of scanning your purchases, you’ll receive points which can be used for gift vouchers. Join and automatically receive a generous $10 Flexi eGift Card after the first time you scan and send over information about your grocery purchases. After your first transmission, receive another $10 bonus Flexi eGift card after your first 4 weeks of scanning. Every time you scan your grocery purchases with the handheld scanner or your phone, you will earn points. 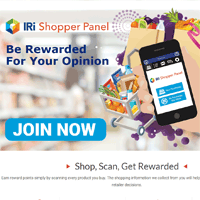 You will also earn point for participating in short surveys, on your birthday, and if you win one of the many sweepstakes opportunities IRI Shopper Panel has to offer. Use your points towards a wide selection of gift cards. Extra points for short surveys, on your birthday, and more!